Retired December 1, 1952. Died Aug. 12, 1971. Edwin Bowman Lyon was born at Las Cruces, New Mexico, in 1892. He graduated from the U.S. Military Academy and was appointed a Second Lieutenant of Cavalry June 12, 1915. His first assignment was at Douglas, Arizona, where he served with the Seventh Cavalry. In March 1916, General Lyon joined the Punitive Expedition into Mexico, and the following December was called to the Aviation Section of the Signal Corps at San Diego, California, as recorder for the examining board for flying cadets. He later graduated from the flying school at Rockwell Field, Calif., and remained at that station as president of several boards having to do with Air Corps expansion. He then went to Ellington Field, Texas, where he graduated from the Bombardment School in September 1918, after which he went to Aracadia, Florida, to take pursuit and gunnery courses. In November 1918, he was assigned to Garden City, Florida, for duty with a heavy aircraft group, and later served at Mitchel Field, New York. 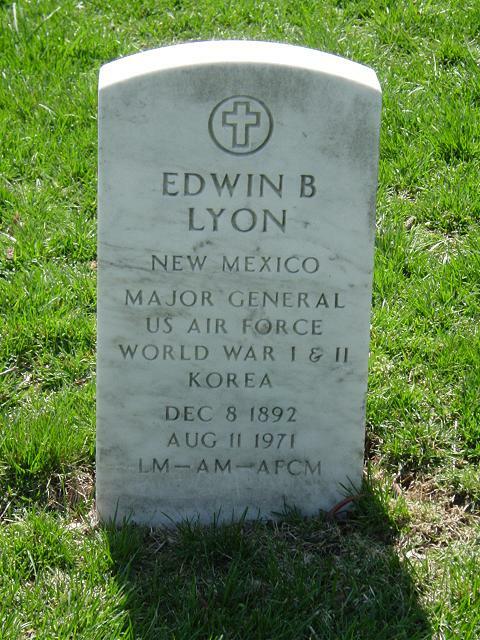 General Lyon, in November 1919, went to California where he was stationed at the Presidio of San Francisco, On July 1, 1920, he transferred to the Air Service, and the following month became an instructor at the U.S. Military Academy. He was chosen First Corps Area air officer at Boston, Massachusetts, in August 1921, and two years later entered the Air Service Tactical School at Langley Field, Virginia. After graduating in June 1924, he was an instructor there for two years. He completed the course at the Command and General Staff School at Fort Leavenvorth, Kansas, in June 1927, and then entered the office of the Chief of Air Corps, where he became chief of the Schools Section. In July 1929, General Lyon went to the Panama Canal Zone to command the 25th Bombardment Squadron at France Field. In August 1931, he entered the Army War College, from which he graduated with honors in 1932. He then was assigned to the office of the assistant chief of staff for materiel on the War Department General Staff. General Lyon became assistant commandant of the Air Corps Primary Flying School at Randolph Field, Texas, in August 1936. Four years later he was commandant of the Basic Flying School at Moffett Field, California, and in June 1941, was named commanding officer of the West Coast Air Corps Training Center there. The following month he was assigned to the Panama Canal Department and in May 1943, assumed command of the Antilles Air Task Force. In January 1944, General Lyon assumed command of the 75th Flying Training Wing at Fort Myers, Fla., and the following May was designated deputy to the commanding general of the Army Air Forces Training Command at Laredo, Texas. In February 1945, General Lyon was assigned as commanding general of the Army Garrison Forces at Oahu, Hawaii. The following July he became deputy commander for administration of the Army Air Forces in the Pacific Ocean Area. In September 1945, he was named commanding general of the Sixth Air Service Area Command, and the next month assumed command of the Army Air Forces in the Mid Pacific. In February 1946, he returned to Army Air Forces headquarters and the following month was assigned to Air Materiel Command headquarters at Wright Field, Ohio. In July 1946, he returned to Army Air Forces headquarters as chief of the Army Air Forces Officers Selection Branch, with additional duty as president of the Army Air Forces Officers Selection Committee. When the U.S. Air Force was reorganized October 1, 1947, General Lyon became director of administrative services in the Office of the Deputy Chief of Staff for Personnel and Administration. The following January he was appointed president of the Secretary of the Air Force Personnel Board at U.S. Air Force Headquarters, and in April 1948 was designated director of the Secretary of the Air Force Personnel Council. General Lyon has been awarded the Legion of Merit and the Air Medal. He is rated a command pilot, combat observer and aircraft observer.